1.The debate is based on unreliable data. We do not have the accurate road capacity data, and the OD matrix. Apparently Bengaluru Development Authority (BDA) has carried out some transportation forecasting, but it was never shared in public. So the entire debate is based on questionable data. Before any elevated roads are proposed, the relevant data must be shared in public domain. An elevated road will just double the capacity, at best. But many of our roads are already overloaded by a factor of 4-5. So the elevated roads won’t solve the problem for those roads. Bangalore has vast interior areas (due to urban sprawl), especially in peripheral areas (outside ORR). Most of them have very narrow streets. These streets are further blocked by the on-street parking of the local residents. According to study, most of the trips in Bangalore are within 12 km. So having high speed long links will encourage people to travel longer. But the local people will not have easier time making their trips. 4. Conversion to bus transit should have the first priority, not elevated roads. If we manage to add just one bus trip, it would make the roads free of 24 car trips! Our priority should be to convert the car trips to bus trips, not to add road surface. If we create more space, more cars will immediately take over the extra space. This principle is known as induced traffic demand. Bengaluru is still expanding at a rapid pace, and people have good purchasing power. The economy does not have a negative sentiment. These factors will lead to an explosion in car population. 6. Despite the doubling of road surface, the speed across it will be the same. When road capacity is expanded, travel speed increases. This brings back the previously deterred potential traffic. Thus the routes become as congested as they were before. This is known as the fundamental law of highway congestion. If you cannot reach your workplace or home faster, what’s the point?? 7. BMTC does not try to woo the public! Conversion to public transport can reduce the traffic 24-fold. Therefore we must first popularize the public transport, which is not that difficult. And BMTC is the only public transport mode that is already available, across the city. So many of us do NOT take BMTC buses, and for good reason: There is no timetable, the buses don’t run on time, there are no direct routes, the waiting period is too long, no seating. BMTC has bought an expensive ITS (Intelligent Transport System) to achieve exactly this. So why is it not working? BMTC has not started collaboration with software parks to run OD-based trips. Instead, BMTC plies empty Volvos for Software Parks that are already on the main Volvo routes. They do not allow other passengers in these buses. This results in crushing crowds in the remaining Volvos. By the time contracted bus return to normal duty, the rush period is over. Running Volvos during this is time means no passengers, which means huge losses. BMTC makes no attempt to address the last mile connectivity. No one likes to walk long distances (especially night time, during the rains, etc). BMTC volvos are designed to carry wheelchairs, which most people do not use. We do have many bikers who could use their bikes for their last-mile connectivity. But the BMTC Volvos do not carry bikes. With a little intelligent management, BMTC can turn the tables. While we debate the cost of elevated roads, we neglect the cost of our existing roads and rail assets. BBMP fudges its spending data to hide how much a road costs in making and annual maintenance. We have fallen in that trap. The roads are taken for granted, and written off as having no value. This article highlights the same problem for our under-utilised rail assets. And THIS is the root of all problem! Even the existing roads are capable of carrying much more traffic. But none of us (government+public) value them, and protect them. Many of our existing woes are because of this. Our road density is worst to begin with, and quickly degrades even further in NEW areas. Why did BDA and BBMP not plan for these roads? A new building needs seven NOCs. None of them ask for assessment of impact on traffic, and mitigation plans. For example, they allowed 30 IT parks, malls, schools, colleges on just one road (ORR). There is no road grid to ease off the pressure. When large plots are developed, BBMP/BDA is supposed to get 25% of it as public roads. But the developers encroach to create “gated communities”. Thus vital thoroughfare roads are lost. The true carrying capacity of the roads is only a fraction of its rated capacity. Reason: Potholes, water puddles, vehicles illegally parked on road, hawkers, beggars, etc. If we are serious, let the public report traffic violations through “Public Eye” and get 50% of the fine. We have not planned for enough off-street parking for all vehicles in the city. So many of them are parked on-road, which steals the road capacity. Here, note that a typical private car remains parked for the whole day, except for 2 trips-a-day. But a BMTC bus keeps moving through the city the whole day. That means it does not reduce the capacity of the road. Let us start with proper data. Let us count our existing assets and make it sweat. Let us make all effort to remove pain points from public transport. It will automatically become popular. Various trade unions have called for a bandh against the Road Safety and Transport bill to be tabled by the government in the parliament. Why are they objecting to the bill? Here is some explanation. More importantly, we need to ensure that GOK works on getting more investments into a Hubli, Davangere or even neighbouring Tumkur or Kolar. We need to learn from Bangalore’s mistakes and ensure it does not get repeated elsewhere. 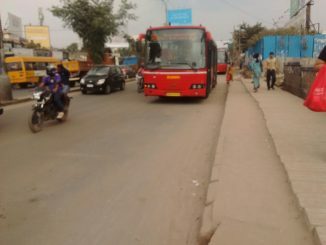 What happened of the BRTS in Dharwad? The work on Metro need to move at a much faster pace and priority should be to link the city across. BMTC can then play a larger as well as feeder role. Moreover, the problem of traffic is mainly compounded by the pathetic condition of Bangalore’s roads – successive govts have done nothing about it. All points made are properly articulated with good data. We can all agree with these points. But my question is how to educate BBMP, BMTC and BDA to to implement this. We can only debate and raise our concerns but they are the one who can take actions. Traffic congestion, illegal constructions and unplanned development of IT parks are hot topics to debate and people have good ideas to plan it and give inputs but it won’t help until and unless these authorities takes action. Yes, BMTC can get ready source-destination data from tech parks. In fact, the offices in a given area can adjust their timings to flatten the peak demand to some extent. So far as the interiors is concerned, BMTC should give up the idea of being the sole MONOPOLY agency. Let private player set up their business in a strictly regulated market. Ola and Uber are already offering car-pooling and autos. They are also on-demand services. BMTC service is tardy. That is correct. We must start a campaign with the management of these utilities. This is a failure of urban planning, and specialized knowledge is needed to resolve the issues. This is not a political issue, and therefore we will not anything by debating this with politicians. The BMTC buses also need a lot of discipline. They remain parked on the road(middle of the road, instead of the side) for about 10-15 min at various pickup points(where lot of people board the bus) until it is totally packed where we cannot even stand. This also causes traffic jams at some places and also discourage people from using the buses. Indeed. There is a nice paper on this very topic, written by Prof Satish Chandra of IIT-Roorkee. I commute to manyata tech park from carmelarem railway station, its easy and convenient. Instead of making the elevated flyovers, try to utilise the existing systems by putting a couple of trains for daily commuters. Also connect them to the tech park using cab facilities. Indeed, there are plenty of options for the feeder services within the current legal/regulatory frame-work. Therefore not much effort is needed, actually! In general, the problem is that the transport hubs (major bus stops, Metro stations, Railway stations) are NOT co-located with the public hubs (tech parks, malls, residential areas, etc). Therefore we need rapid shuttle service between them. Once you are in a rapid transit hub, you are carried away fast. The shuttles can be provided by multiple players: BMTC shuttle mini-buses, Uber/Ola car-pooling or autos, etc. These vendors would be glad to collaborate in such planning. They also have the computerized system to cater to fluctuating demand. That should bring down their congestion charges too! Absolutely, there is not a single argument in favor of elevated. At best it will serve the purpose of imminent election funding. Promote BMTC, suburban Rail and speedier implementation of metro. We should move people not individual motorised vehicles… Let’s move away from elitist thinking. Of the available options, BMTC is the only mode that is already present and can be rapidly re-deployed. The other options like Metro, LRT, Rail etc need heavy infrastructure, and therefore will take time. Any changes in the BMTC arrangements can show result from the very next day, and create a positive climate for further changes. We can start if just one major people hub takes the initiative (e.g. Wipro/ELCITA) to share their employees’ daily commute data so that BMTC sets up NON-contractual bus routes. Declare a bus week for this mass-conversion, and celebrate it in style. Let the senior executive set example by taking the bus. The rest will follow via social proof. I stay in Banashankari.. 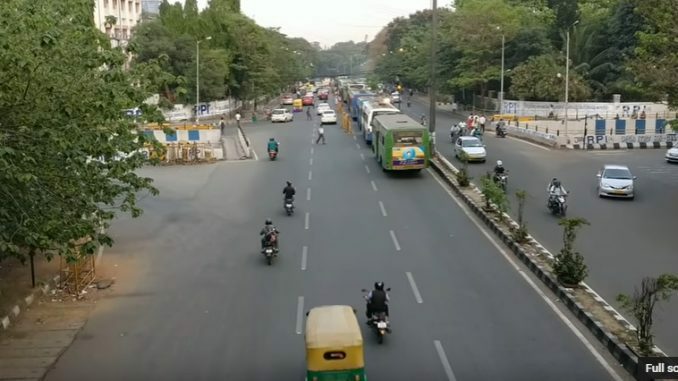 Using nice road often to reach electronic city, BG Road etc.. It’s saving 2 hrs of travel time in peak hours.. We need elevated highways to connect whitefield, airport, KR Puram and Sarjapur road..
How would you like a better connectivity of Banashankari and Whitefield through Volvos, Suburban rail( if possible) and Metro? You can even relax/work during your transit if proper transportation is provided rather than roads. Unfortunately that is not the case in Bangalore! Bangalore suffers a loss of Rs 3700 Cr annually, due to traffic jam. BMTC can rescue all of us, and increase its ridership in the bargain. Instead, it is shrinking operation, to save a loss of Rs 120 Cr annually. In the last 3 years, BMTC cut of 68000 “nonviable” trips. They were planned without knowing the travel demand in the first place. Similarly, part of the loss would be due to bad management/pilferage. BMTC is run with our pooled money. We can overlook this small loss to prevent a 31-times larger loss. A BMTC and private bus stopping randomly on busy roads and junctions causes traffic jam equivalent of 24 cars. A car going on the other side of the divider can also block traffic both ways. But yes the buses should stop only at designated stops and not stop the traffic. Bus has 100 people – until one bus blocks to the extent of 100 cars we should allow it. However buses should be provided with bus bays and dedicated lanes. Yes, any type of road block should be viewed as economic offense, and fined heavily. If the traffic police is too busy handling VIPs, then we should crowd-source it, with a twist: Let the public report and offense and collect 50% of the fines. Don’t people earn by issuing PUC certificates? This is the same idea!